For some time, I genuinely thought Drake and I had a great deal in common. But, as time went on, and he really started getting famous, that feeling began to slightly subside. And then, with Drake’s fame came Drake’s “Drake obsession.” And with Drake’s “Drake obsession” came Drake’s Instagram. And with Drake’s Instagram came Drake’s new moniker, “Champagne Papi.” When he began referring to himself as that, it became clear the guy I once saw moderately as a peer was no longer someone I felt too much of a connection with. Yes, the bar mitzvah video for “HYFR” got me back on the “yes, OK, we’d totally be BFFs” bandwagon, but those friendship butterflies only lasted for so long. Then last week, Drizzy’s Twitter alerted the world of some uncharacteristically wholesome Aubrey news. This was exciting news for our nonexistent, completely one-sided fake friendship. Drake, the newly focused scholar, taking a rare break from telling girls to drop down and get their Eagle on in order to alert us of his academic accolades. I liked this. I liked this a lot. And then, just a few days later, word got out that Drake spoke at the high school graduation ceremony of Jarvis Collegiate Institute. And that there was a video of said speech. Good speech, 26-year-old Drake. 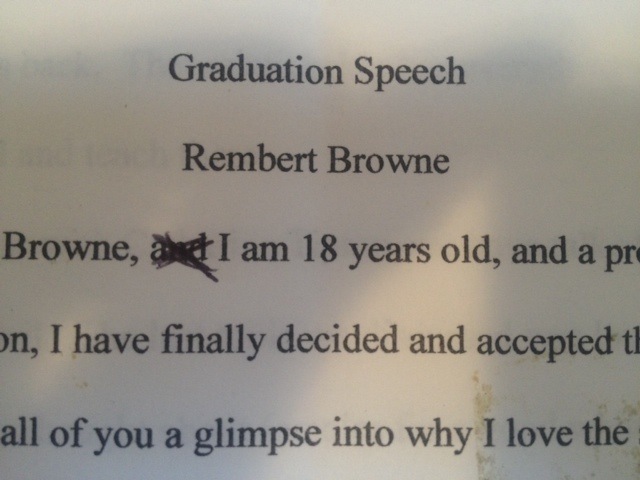 But how did it compare to another noteworthy graduation speech, delivered seven years earlier by a young man just a few months removed from his 18th birthday? Let’s put them side by side and figure it out. 1. Is the speech delivered at the school attended by the speaker? Graham: No, the newly diploma-ed Aubrey spoke at another school’s graduation, as a peer and as a mentor. Browne: Yes, because that’s how graduation speeches are supposed to work. ADVANTAGE: Drake. Who wants to hear from some loser classmate when they can watch the guy who throws bottles at Chris Brown and then sings sweet nothings into Rihanna’s ears? On multiple occasions? Even I can admit that. 2. How was the speaker in question dressed? Graham: Some sort of sweater hoodie thing, with a gold chain dangling. Browne: Black suit and tie (both picked out by mom) and black shoes that were promptly kicked off once feet were hidden behind podium. ADVANTAGE: Browne. Without question. Don’t make it so obvious that you’re headed out post-someone else’s graduation, Drake. At least give the people the illusion that you got dressed specifically for this event. ADVANTAGE: Browne. Easy. Also, a super humblebrag. I’m both embarrassed and proud. Browne: There isn’t one morsel of advice in this entire speech. I reread it four times looking for one, but there’s just nothing. Just me telling stories about Les Misérables and high school race relations. ADVANTAGE: Graham, but let’s be honest, this is more of an honorary degree approach than a speech to your peers, even if everyone in the room has the same rudimentary knowledge of the special triangles, SOHCAHTOA, and what not. But yeah, advantage = Aubrey. ADVANTAGE: Browne, on the mention of urination alone. Also, I need more proof, Champagne Papi, about that whole “material things” tidbit not mattering that much. Don’t lie to the kids; you know they’ve been listening to “Pop That” all summer. 6. Impact speech had on the females in the audience? Graham: A lot, including a chorus of “awwwwww” after he brought up his mother and screams once he finished the speech. Browne: Zero impact, but the line “when I was thinking about love in class, I naturally thought about females for a good while and then I thought some about my family” is not only noteworthy for the use of “females,” but also because it’s easily the most brazen thing I’d said at that point in my life in front of my mother. ADVANTAGE: Graham, but I’m a huge fan of 18-year-old me right now for that smooth line. ADVANTAGE: They’re both super corny, but I think I have to give the last-line edge (and the 4-3 win) to Aubrey. I don’t like the idea of 18-year-old me doing something better than 26-year-old Aubrey, so seeing him deliver a moderately heartfelt passage to a bunch of impressionable strangers who will hang on to his every word is something I do appreciate. Drake, you continue to confuse me and keep me on my toes and make me wonder if this friendship is ever going to flourish the way it was meant to. It’s frustrating, but I’ll continue to go along for the ride. With this speech, along with the unfollowing of all of your social media outlets, I feel as if we’re back in a better place. Congrats to us.